We have begun using the updated translation from Latin into English in the Holy Mass. It will take time before we get use to it. So, you and I will have to be careful and read what we are praying. Other language translations were accurate and did not need adjustment. As we continue to say and pay attention to the prayers of the Mass we will come to appreciate their beauty. 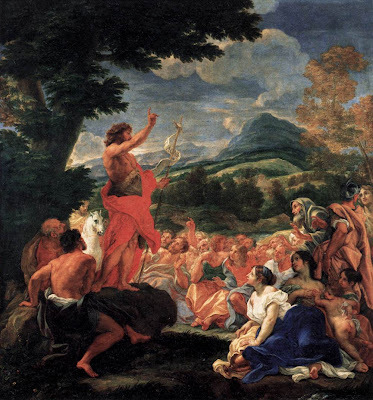 In the Gospel today St. John the Baptist was preparing the people for the advent of the Messiah. It is worth meditating on St. John the Baptist. He is a good example for us. St. John's whole life was determined by his vocation, that is, to prepare the people to receive Jesus. He carried out this task without holding back; he gave up his life for this purpose. He did not consider himself, nor his desires or comforts. He did not say that he was the cousin of the God's Son or that he was the son of Zachariah of the priestly tribe. No, he said that he was the voice of one crying in the wilderness, one who was not worthy to unfasten the sandal straps of Jesus. Like the Baptist, we should want to bring others to Jesus. By being friendly and helpful to others, we are preparing an environment that can be receptive to God. Each of us can ask ourselves certain key questions. Do I desire to bring the people around us closer to God? Do I give good example in the workplace, at home and in public places? Do I speak about God to my relatives, friends and colleagues? We should not make ourselves the center of attention. Without humility we cannot bring others to Jesus. What is important is that Christ should be announced, known and loved. Only He has the words of eternal life. One most worthy way of imitating the zeal of St. John the Baptist is to invite someone to Church. We should not be hesitant to ask a friend, relative or coworker to come with us to Confession and to Mass. Sometimes such an invitation is much appreciated. This is something that we can always think about doing, not just now as we approach Christmas, but always throughout the year.